Derek Stepan dons the Broadway Hat following his clutch tying goal with 1:13 left in an exciting Rangers’ 3-2 shootout win over the Devils. AP Photo via Getty Images courtesy NYRangers. Some games are uglier than others. That applies to wins in almost any sport. Winning ugly is better than losing. Let’s just chalk this one up to that. In the second installment of the Battle of Hudson in a MSG rematch a week later, you got a much more competitive game between blood rivals. 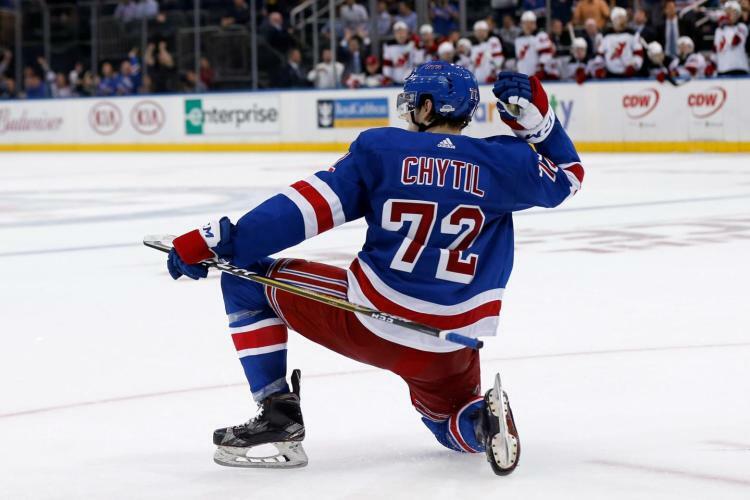 The Rangers dug deep rallying from a pair of one-goal deficits in the third period to pull out a 3-2 shootout win over the Devils. It was an entertaining game which had a bit of everything. 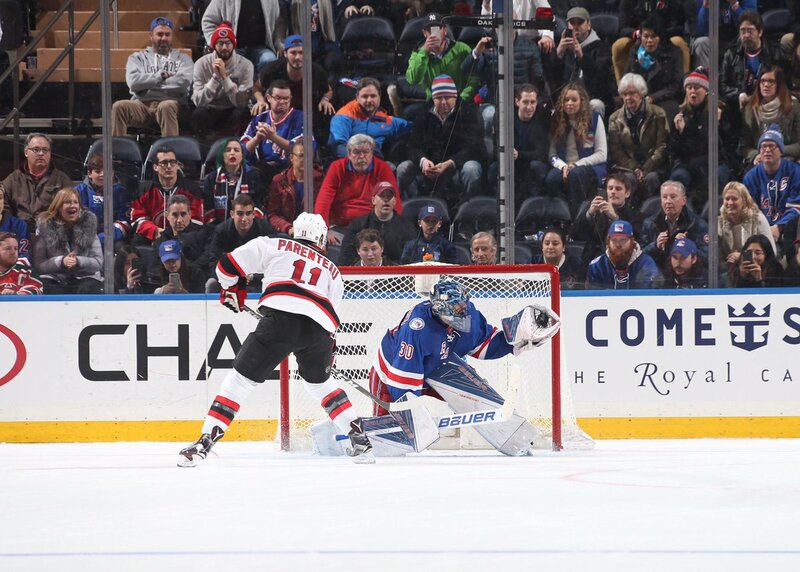 There was top notch goalkeeping from both Cory Schneider and Henrik Lundqvist. Each took turns making key saves with both permitting two goals in 65 minutes of action. There also were momentum swings. The kind you expect in a rivalry game. Both teams were also exhausted. Each were playing for the third time over four nights. Each for the second straight day. The Devils were attempting to end a five-game losing streak. The Rangers looking to make it three straight wins with Lundqvist back in net. It wasn’t a surprise that New Jersey came to play. They wanted to finish a four-game road trip with a victory. They also wanted to erase last week’s nightmarish performance in the same building. After a sluggish start with the Devils giving up multiple shorthanded chances on an early power play, they turned it around. It was the Rangers who came out ready getting seven of the first nine shots. That included Kevin Hayes and J.T. Miller nearly hooking up for a shorthanded goal. But Schneider was sharp from the outset and prevented any early goals this time. Maybe a night off helped his psyche. Keith Kinkaid allowed only two in a 3-1 loss at Ottawa. Following the early Ranger pressure, it was the Devils who took over. They finished the first period by registering nine of the final 10 shots to outshoot the Rangers 11-8. However, Lundqvist was strong in keeping the game scoreless. He made a couple of big denials in tight including on Taylor Hall. The Devils were the better team five-on-five during the second half of the first and the entirety of the second. They also converted on special teams. After failing on two chances earlier, they were able to convert on a third opportunity. With Marc Staal off for his second minor for delay of game, Kyle Palmieri patiently held the puck before firing a tough low shot that Lundqvist couldn’t control. P.A. Parenteau got to the rebound and sent it on the goal line before Lundqvist accidentally knocked it into his own net for a Devil 1-0 lead at 4:37. Damon Severson added a helper. It was a good response from Parenteau, who was a healthy scratch the previous two games. He was able to net his seventh of the season. Two of of his seven goals have come on the power play. Hardly the production you come to expect from a guy who usually is effective in that role. Maybe the goal is the start of something. He received 2:28 on the power play of his 10:35 of ice-time. The Devils really did a good job in the middle part of the contest. They continued to challenge Lundqvist. He was the reason it remained a one-goal deficit. To tell you how much the Rangers struggled in their end, the shots went from 7-2 in favor of the home team to 18-12 Devils. They were the aggressor. That included a few pokes at Lundqvist after whistles where there was again no response from his teammates. When the Blueshirts finally got a second power play, they hardly did anything. An all five lefty unit didn’t get much accomplished. They took way too long to get set up. The Devils penalty kill was also better. More aggressive, they attacked Ranger puck carriers forcing them into mistakes. There weren’t many forwards going in the period. But Rick Nash was everywhere. He created several opportunities with his great strides. One such instance saw him fly up ice around Severson and have Schneider dead to rights. But he missed. Nash totaled five shots on goal and missed the net three times. His line with Hayes and Miller made things happen. Hayes and Miller have amazing chemistry. It’s just a matter of time before they break out. On a good Ranger cycle, Oscar Lindberg got nabbed for a hooking minor which gave the Devils a fourth power play. It wasn’t a very good call. Sam Rosen thought the penalty was on Miller for knocking down a Devil. Unable to capitalize on a two-minute power play that carried over to the third, New Jersey was still clinging to a one-goal lead. It’s no secret they haven’t been in this position much. The last time they led after two periods was in a 3-2 home win over the Canucks on Dec. 6. The Devils sat back a little bit. They kept waiting for that mistake. It nearly came on a horrible change by McDonagh. It wasn’t really his fault. As he was coming off for Staal, an outlet to rookie Miles Wood put McDonagh in a tough spot. Not wanting to be caught for another bench minor, he jumped on the bench. With Staal in an awkward spot not realizing Wood had the puck, that allowed the speedy Devil forward to break in on Lundqvist, who forced him wide denying a backhand. That was a turning point. Finally able to get a sustained forecheck, Brady Skjei chipped a puck behind the net to Mats Zuccarello. Prior, Lindberg changed for Derek Stepan and kept the play alive. With Zuccarello behind the net, he duped Schneider by quickly centering for Chris Kreider in front for a tap in which tied the score with 11:50 remaining. Schneider fell asleep on the play and did a poor job losing sight. That allowed Kreider an easy finish for his ninth. After a couple of shaky moments in their zone, the Devils responded thanks to Wood. One of their best players, the rookie was able to park himself in front of Lundqvist and take a Adam Henrique feed and score his third for a 2-1 New Jersey lead with 9:28 left. Palmieri started the play by gaining center ice and dumping the puck in behind the net. Henrique blocked Dan Girardi’s reverse and then retrieved the puck from Zuccarello, who missed a check. Henrique quickly centered for Wood, who beat McDonagh in front. It was terrible defense from the Rangers’ top pair and Zuccarello. The only question that remained is whether the Devils could hold on. They didn’t give off the impression they were comfortable playing with a lead. Ranger coach Alain Vigneault shortened his bench. For some inexplicable reason, Nashville hero Jimmy Vesey didn’t see the ice. However, Marek Hrivik and Jesper Fast did. Hrivik continues to look like a player capable of contributing. He only played 5:51 but was noticeable during his 10 shifts. With the Devils starting to back off, the Rangers gained momentum. Vigneault pulled Lundqvist with a minute and a half to go. Following a Devil icing, the Rangers set up a faceoff. With Vigneault having used a timeout during the second with his players exhausted after icing the puck, it was left up to the six skaters to make it happen. Having struggled with his decision making lately, Stepan has come under criticism. Some have wondered if there’s something wrong. He just hasn’t looked like himself. However, he came through in crunch time by delivering the game-tying goal with 1:13 remaining. On it, Vigneault made a smart move replacing Girardi with Kevin Klein. A better skating defenseman, he made a good play at the point off a Stepan faceoff win. Klein fed McDonagh, who improvised by slap passing for Stepan in the slot for a nifty deflection that beat Schneider for his sixth. For however predictable he can be passing the puck, Stepan’s always had the uncanny ability to deliver in the clutch. We saw it in both the 2014 and 2015 playoffs. Most notably victimizing the Caps in Games 5 and 7. The goal was his first in eight games. For a second consecutive night, overtime was needed. Unlike the odd one on Saturday at Nashville, this three-on-three was wide open. Both teams went for it which made it fun. The Devils stuck on Hall with Travis Zajac and John Moore. The Rangers with Hayes, Nash and McDonagh. A wild and unpredictable start included Schneider stopping Nash and then Hall having two glorious chances to end it on a turnover. Wood also got another chance but was denied by Lundqvist. Miller tried a dipsy do backhand that missed in the closing seconds. Hall got one last shot on Lundqvist which he stopped, forcing a shootout. The skill competition isn’t as fun as three-on-three. But it does result in a winner. Vigneault opted for Zuccarello, who made Schneider look bad faking backhand before going to a forehand tuck for a 1-0 lead in Round 1. Lundqvist then didn’t go for any of Parenteau’s fakes and calmly gloved his shot. Saturday’s hero Vesey tried to go to the backhand but Schneider thwarted him. Out came Hall for the bottom of the second. But his forehand triple deke was stopped by a sliding Lundqvist. Stepan nearly ended in the third round with a cool slap shot that Schneider got a piece of pushing it off the goalpost. Mike Cammalleri evened it in the bottom half with a nice backhand five-hole after a pump fake. A move I knew was coming. In the fourth round, Hayes took only his second shot in the shootout. He cleanly beat Schneider five-hole with a quick snapshot. With the pressure on a second consecutive round, Devil coach John Hynes went with Severson. But an aggressive Lundqvist made a nice pokecheck to notch his second straight win in the shootout (third overall). Notes: Since returning, Lundqvist is 3-0-0 allowing only three goals on 90 shots for a 0.98 goals-against-average, .967 save percentage with two shutouts. … Over the last seven games, Ranger goalies have allowed two goals or less. During that span, the combination of Antti Raanta and Lundqvist have posted a 0.84 GAA with a .966 save percentage (173 saves on 179 shots in 430 minutes) and three shutouts. … Despite registering five shots, Hall went without a point for fourth straight game. He’s minus-four and has one assist with no goals in the last five. … After permitting 14 goals on 110 shots in his last three outings, Schneider gave up two on 27. His best effort since a 12/6 win over Vancouver (22 saves on 24 shots). … Palmieri tallied two assists. He’s without a goal in six straight. … With a helper, that gives Henrique three points (1-2-3) the last three and six (2-4-6) in six. … Wood has goals in two of the last three games. He’s got three overall in 12 games since his recall. … Healthy scratches for the Devils were Jacob Josefson, Devante Smith-Pelly and Luke Gadzic while the Rangers sat out Brandon Pirri a second straight and Adam Clendening. … Devils held the edge on draws going 31-and-26 paced by Vernon Fiddler (9-and-1). Hayes was the Rangers’ best finishing 12-and-7. … Teams combined for 33 blocked shots with the Devils holding a 17-16 edge led by Moore and Severson (3 apiece) while Girardi paced the Rangers with 4 followed by Klein (3). … Rangers (23-10-1) visit Penguins Tuesday while Devils (12-12-7) host the Predators the same night with the Flyers visiting Newark Dec. 22. Game Photo: Lundqvist ties Dominik Hasek for 12th on the all-time NHL list in victories (389). Henrik Lundqvist makes a glove save on P.A. Parenteau in the shootout. AP Photo via Getty Images courtesy NYRangers. Quotable: Cory Schneider on Devils’ effort in a tough defeat. Cory Schneider following #NJDvsNYR: "Sometimes that's hockey. We had it right there. Good effort but again, we need results." Video Gif: Miles Wood finishes off in front on a Adam Henrique feed from behind the net. This entry was posted in Battle Of Hudson, Devils, NYRangers and tagged Alain Vigneault, Battle Of Hudson, Brady Skjei, Chris Kreider, Cory Schneider, Damon Severson, Derek Stepan, Devils, Henrik Lundqvist, John Hynes, Kevin Hayes, Kevin Klein, Kyle Palmieri, Mats Zuccarello, Mike Cammalleri, Miles Wood, P.A. Parenteau, Rangers, Ryan McDonagh, Taylor Hall. Bookmark the permalink.